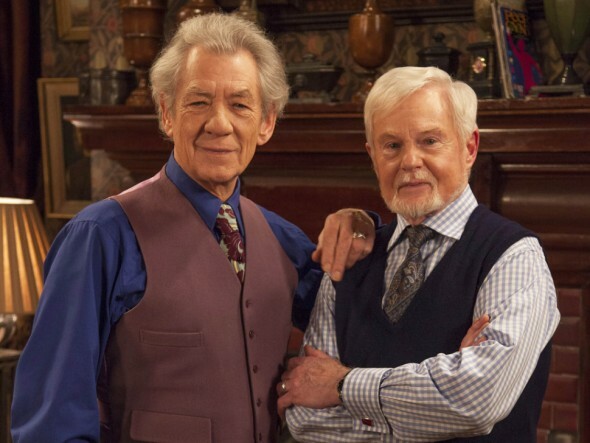 Vicious has been cancelled by ITV. There will not be a third season of the series. There was speculation earlier this week that the show was being cancelled. A previous TV Series Finale report talked about the possibility of a cancellation when news of a special for the series was announced. Are you sad to hear about the cancellation of Vicious? Tell us what you think. More about: Vicious, Vicious: canceled or renewed? Bring it back! Or a movie. Please say it isn’t so! Love this show, please bring it back! I heard that we lost Ian last year and suspect that maybe he became ill and that could be why the show was cancelled. So sad. Love the show and the actors. RIP dear Ian. So sad Tom see this marvelously humorous and earthy comedy come to an end. Not many shows of this high camp caliber on TV any more. Great scripts, fantastic talent, wounderful chemistry between the actor family. You can tell they love doing what they do, giving us all joy and happiness in this otherwise horrid world. Please, please come back soon. Sad to see this show end! Imagine cancelling a show that actually made you laugh out loud. Watched every episode at least twice so far. A huge cast of super stars. Sad! Love it love it take some of those houses wives off. My husband and I absolutely loved Vicious! So disappointed to see it cancelled! Why??? I love Vicious. It is one of the very few shows that makes me really laugh. My 16 year old son loves it too.